Thank Oskar Blues of Lyons, Colorado, for serving Dale's Pale Ale in a can back in 2002. Ten years later, there are dozens of craft breweries making their beer available in cans. But why cans? Doesn't it ruin the taste of the beer? Actually, just the opposite is true. Modern cans, unlike cans from more than 20 years ago, have a water-based polymer lining that prevent the beer from touching any metal while in the can. Canned beer has a better seal than bottles, locking out oxygen that can damage the beer. No light can get inside, which means a canned beer will never be light struck, or skunked. Environmentally, cans are more easily and more often recycled than glass, and because cans are lighter, they take less energy to ship. Finally, cans are much more portable and can go many places where glass cannot. 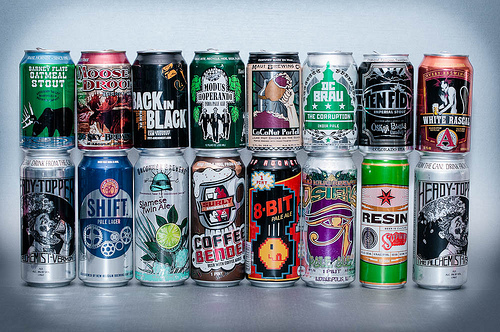 In no particular order, here are my top 15 craft beers in a can. Special thanks to Avery, Sun King, Tallgrass, DC Brau, and Ska Brewing for sending samples. Another special thanks to my friends who were able to provide me with cans of The Alchemist, Sixpoint, and Surly. For more on craft beer in a can check out my craft beer in a can articles on Beer 47. David Jensen is based out of San Francisco and is the primary writer and photographer for Beer 47, a blog focused on craft beer, beer events, cooking with beer, and homebrewing. In addition to the blog, you can frequently find David on Twitter as @beer47, tweeting interesting news and sparking up conversations about craft beer while sipping his favorite Double IPA. By day David is a software engineer for a small Internet company.